When the little one wakes up with a mild fever, tugging at his ear, most parents assume (often correctly) — it’s an ear infection! So, like all good parents do, they quickly make a doctor’s appointment to get a prescription for antibiotics, to take care of that nasty infection fast. Is this really the best way to handle ear infections? Are there natural ways to treat them successfully? Here’s what you really need to know about ear infections. 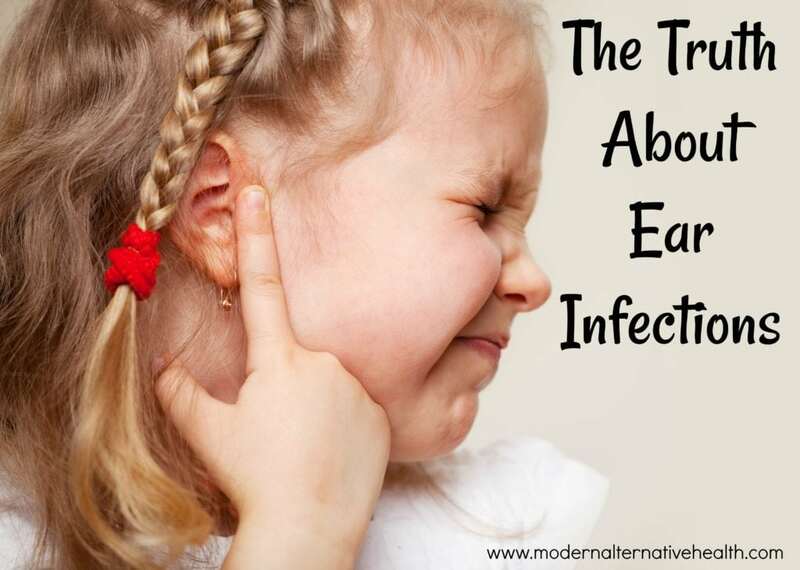 Ear infections are incredibly common. Most children will have experienced at least one by the time they are 5 years old. Some children get them repeatedly, and they are a top reason for doctors’ visits every year. There are different types of ear infections. It’s possible to have fluid in the ear without pain/symptoms, which usually requires no treatment. A middle ear infection can be caused by bacteria or viruses, and often resolves within 2 – 3 days without any treatment. The CDC currently recommends waiting those 2 – 3 days to see if the ear pain or infection resolves before resorting to antibiotics (source). Up to 82% of children will get better within a few days with or without treatment, and treatment increases the risk of gut-related side effects (source). Depending on the severity of the infection, the ear drum can perforate (or burst). This happens in anywhere from 5 – 30% of cases. When it does, it is not considered a medical emergency (unless the child has a high fever or is in extreme pain), and in 85% of cases, it heals fine on its own (source). There is no increase in complications if antibiotics are not used (source). In general, ear infections are not serious. Hearing loss as a complication is extremely rare, and typically mild, and only occurs after recurrent ear infections (source). From the information above, it’s easy to see that it’s not necessary to run to the doctor to get antibiotics at the first sign of ear pain. It’s better to wait a few days and provide some symptom relief, or use natural remedies, to see if symptoms resolve first. Usually, they will. So, how does a parent treat ear infections at home? Use garlic-mullein oil (or just mullein oil) in the ear if the ear drum has not burst. Place a few drops in the ear, gently tug on it to get it down in, and let it sit for a few minutes. Then drain, and do on the other ear if needed. If you prefer, you can also use hydrogen peroxide for this. Use rosalina, lemon, or fir needle essential oils diluted to 0.5% and rub around the outside of the ear. Spearmint is also safe. These are for young children. Adults and kids over 10 can also use eucalyptus, rosemary, or peppermint. Drink warm mullein tea (1 tbsp. in 1 cup boiling water, sweetened as desired). Elderberry is also a good choice. Astragalus root is a general immune booster. We use Elderberry Elixir (a tincture) to help promote immune boosting and knock stuff out quickly. Fill a sock with a natural salt, then warm it for a minute in the microwave (or about 10 – 15 min. in the oven). Place this over the affected ear to help draw out the pain. If more help is needed, chiropractic care may be beneficial. There aren’t enough studies to prove that it is helpful (source) but many parents swear by it. In general, these remedies will help to reduce pain and relieve symptoms so the ear infection can get better, naturally! Typically, ear infections will get better on their own, even if the ear drum ends up perforating. Most commonly, it’s not an issue. If you have a serious concern, you can always make a call and see. How do you handle ear infections? I’m a bit confused as to how social/economic status or education level can be a risk factor for ear infections. We are lower income right now by choice since I am a sahm but we are well educated. My children get repeated ear infections. It has to do with the not yet straitened eustachian tube. Onion juice is GREAT. At the first sign of ear pain I chop or grate a small portion of an onion and squeeze out the juice. I put just a few drops into the ear. I have never needed more than two applications. It stops pain and infection!